……….. I know, I know, if you’re a regular reader or a friend, you might be thinking, “what else is new?”………. “what in the world is she up to now?” ……. well, I decided to take my favorite focaccia bread recipe and give it a new twist. One evening last week we planned an early evening bike ride with my son and his wife, with a picnic dinner along the way. A delicious sandwich along with a salad packed in little jars sounded like the perfect portable meal. I had some wonderful roasted chicken and knew it would make a delightful (and easily transported) sandwich on focaccia bread……… this is where the “crazy” part comes in – looking through my pantry, I spied a bag dried cherries and thought it might be a nice addition to the focaccia along with some fresh rosemary………. then I got the idea for a sprinkle of toasted pecans over the top. A bit strange? Yes. But don’t they say “no guts, no glory”? I have to admit that my “concoction” results are not always so stellar, but this one is a winner! I’ve made it three times since our picnic dinner and have trouble keeping it in the house. 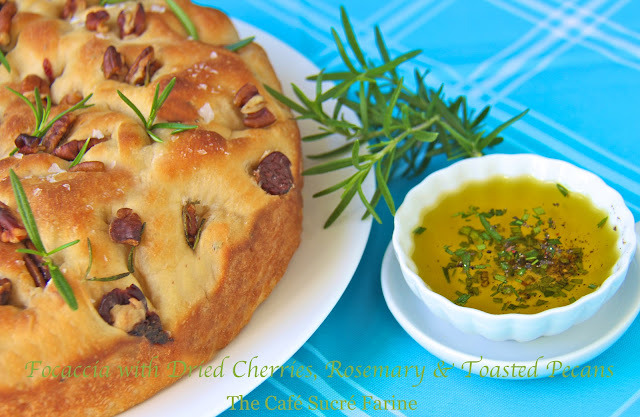 Besides making fabulous sandwiches, this focaccia is wonderful with soups, salads or as a fun and interesting dinner bread along with some yummy olive oil for dipping. The bread freezes well and, if you have a heavy duty mixer or bread machine, it requires no hand-kneading. Why not try something “crazy”? 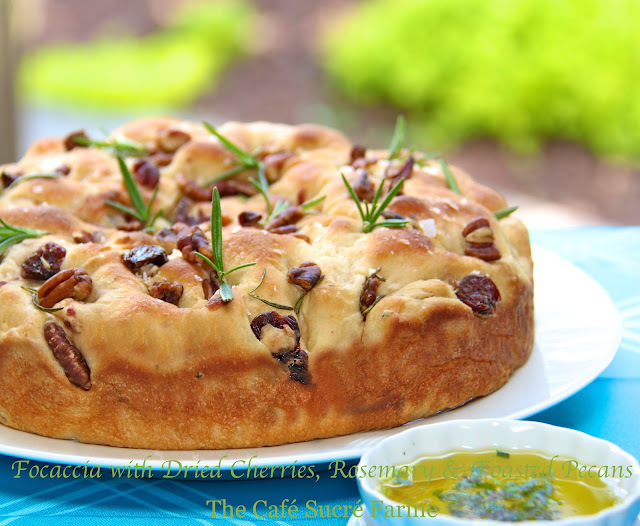 Make a picnic, a brunch, even an average dinner super special with this Focaccia with Dried Cherries, Rosemary & Toasted Pecans. 1. Warm the milk and water to 110 to 115˚F. (I do this in the microwave. I put it in for 2 minutes and then check the temperature. If it’s not warm enough, continue to heat for 15 seconds at a time, checking the temperature after each cycle.) Once the liquid is the right temperature, add the brown sugar and stir to combine. Sprinkle the yeast over the warm mixture, stir again and let stand until bubbly*, about 5 minutes. Add the 3 tablespoons of olive oil. 2. Using the dough hook on a stand mixer**, mix the flour, salt, and chopped rosemary. Add the yeast mixture and mix until a soft dough forms, about 2 minutes. Continue to mix with dough hook for 10 minutes. 3. Oil a large bowl, place the dough in the bowl and turn it once to coat the top or just move the dough to one side of the mixer bowl, drizzle a bit of olive oil into empty side of bowl and then turn the dough until lightly greased. Cover the bowl with plastic wrap and let the dough rise in a warm, draft-free place until doubled in bulk, about 1 hour. 4. Oil 2 or 3*** 9-inch cake pans. (I use about 2 teaspoons of olive oil per pan.) On a generously floured work surface, punch down the dough, divide in 2 or 3 equal pieces, pat each piece into a circle approximately the size of your cake pans. Transfer to the prepared pans, and continue to flatten the dough with your hands to cover the bottoms of the pans completely. Cover loosely with plastic wrap or a kitchen towel and let rise again in a warm place until doubled in bulk, about 1 hour. 5. Preheat oven to 425°F. 6. Using your fingertips, press down firmly into the dough to make dimples about 1 inch apart and 1 inch deep. Lightly brush the entire surface with the remaining 2 tablespoons oil and sprinkle with the sea salt, rosemary and toasted pecans. 7. Bake until golden brown, 20 to 25 minutes. Check after 15 minutes, if bread is getting too brown, cover loosely with foil and bake at least 5 more minutes. Slide the focaccias onto a wire rack and let cool completely. Cut into wedges to serve. Serves 8-10. * If yeast mixture does not begin to bubble and “grow”, do not proceed with the recipe. Either your yeast has lost it’s potency or your liquid was too hot or too cold -this is the only secret to working with yeast – make sure your liquid is between 110 and 115 degrees. Use a thermometer! You can purchase an inexpensive thermometer at home or kitchen stores, even grocery stores will often carry them. ** You can also do this in a bread machine or by hand. If using a bread machine, add all ingredients as directed in machine instructions using the dough cycle. After dough cycle has completed, remove dough from machine and proceed with directions above. If mixing by hand, mix all ingredients with a heavy duty spoon, then turn out onto counter and knead for 8-10 minutes or until smooth and elastic. Proceed with directions above. *** This recipe makes two or three 9″ focaccias. If I’m making sandwiches, I often make 3 focaccias yielding thinner round loaves, so the sandwiches aren’t so thick. If I’m serving it for a dinner bread, I like to use 2 pans and make it a bit thicker. The pictures shown are using the recipe and baking the focaccia in 2 pans. love focaccia! And with nuts and rosemary and dried fruit it can only be to die for! Love focaccia bread and with the cherries and pecans it would be gone quickly in my home. As for the rosemary for some reason my husband thinks he has an allergy to it but I think it’s that he just isn’t fond of it. So I’d have to leave that out and add some other herb. Sounds like a fun time biking with your hubby, son and his wife. What a glorious day! This is my first time visiting your blog. Bread looks fabulous and not so crazy. I had a turkey sandwich at a restaurant years ago on artisan bread with dried cranberries and rosemary in it. Fabulous- and I will be trying your recipe-thank you! I love combining sweet with savory, even in bread. That looks so delicious and your photos are gorgeous. 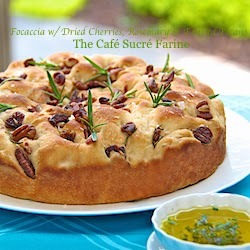 Oh Chris, I’m in love with this focaccia you are so smart to “invent” such a wonderful combination, you are gifted! Definetely in my to do list. Foccacia are perfect for sandwiches! This one, I’m bookmarking it because it looks so good for a sweet and savory treat! Really, it was a good idea Chris… I always like what you’re coming up with! This looks wonderful! I could see using it on a chicken sandwich. Is it so wrong to want a chicken sandwich at 5:20am? Crazy/brilliant, sometimes the same thing. This is a beautiful treat and I think you’re having the time of your life. What wonderful times you have with your family. Chris I love all your ‘crazy’ concoctions and this one looks wonderful. I’ve never seen cherries with rosemary before. I might have to try it with some other bases too! I may be looking right at them but don’t see the pecans in the ingredients list. What quantity? This doesn’t sound strange at all. I think it sounds fabulous. 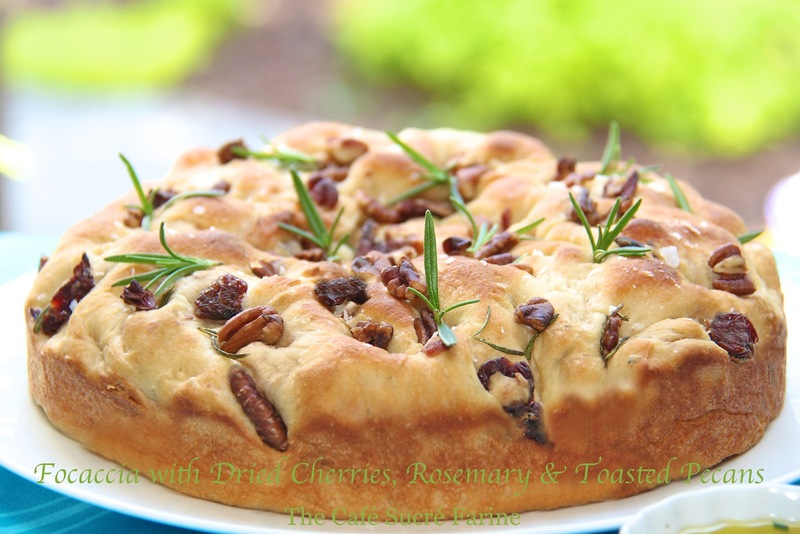 I make a bread with cherries, pecans and rosemary myself but never thought about using it for chicken sandwiches. Thanks for the idea! Hope you have had a great Easter. This must be good and it looks so delicious! Looks wonderful!!! Almost too fancy for a picnic! It looks so BEAUTIFUL!! And I adore the idea of a picnic with this lovely bread and roasted chicken. Sounds like the perfect evening. Hey there Chris. I’m not doing much reading tonight, having just gotten home from my in-laws, but I wanted to wish you a Happy Easter! I hope your celebration of the day was fantastic. The bread sure would have been a beautiful addition to the table. This sounds like amazing sandwich bread! I know I would like it. I made your lemon rosemary roasted chicken breast recipe for Easter dinner at our house. It was a huge success. I’ll definitely be making that one again.